Seurat had already acquired precocious skill in drawing by 1877-8 – his copies of work by Raphael, Poussin and Holbein are notable for their remarkable exactitude. Later, progressing to his mature style, he worked with conté crayon and a special highly textured Michallet paper. 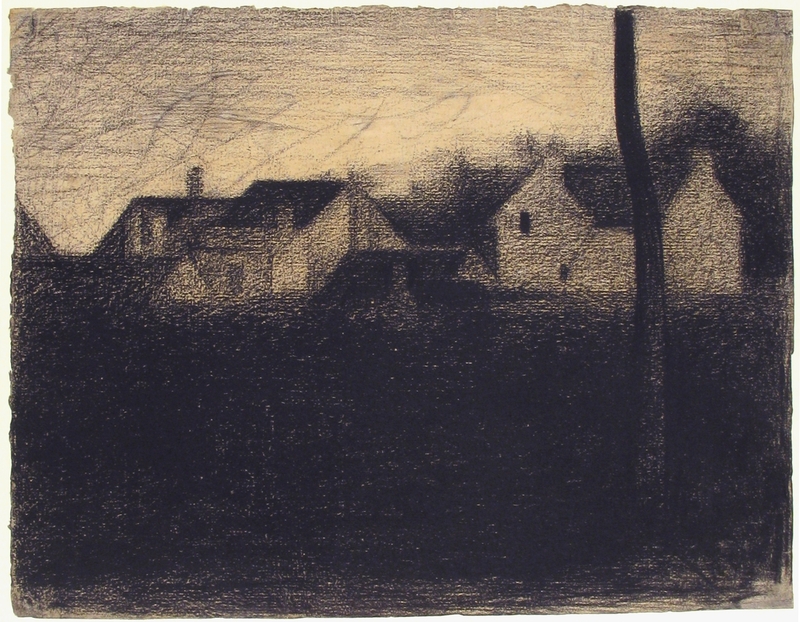 When exerting differing pressure on the black crayon (made from chalk and charcoal bound together with clay) he produced tones from dense blacks through lustrous greys to white where he left the paper untouched. 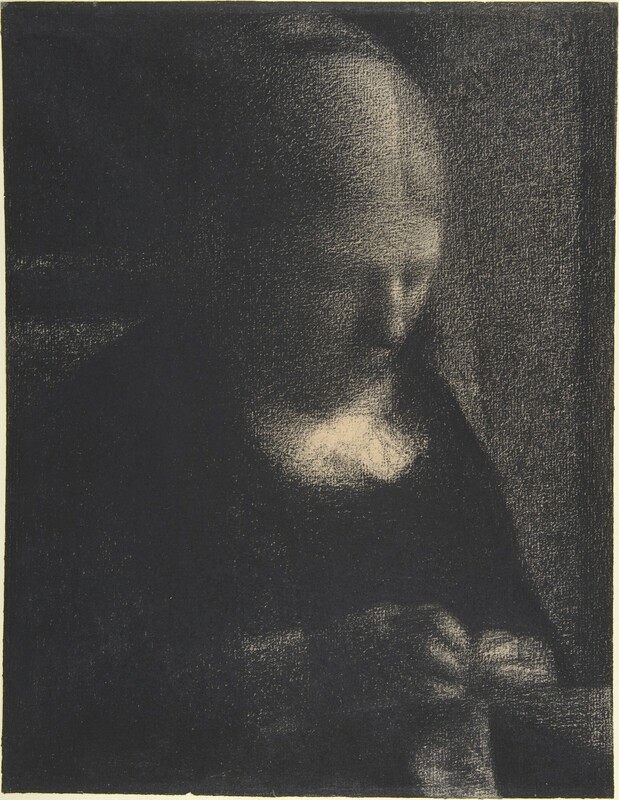 The texture of the paper produced a grainy surface effect which he later replicated with his divisionist technique when creating his paintings. The tenebrist effect of most of these drawings create an introspective, meditative mood. An early example of his singular drawing style is a portrait of his mother dated to 1882-83. She is intent on her needlework – we may surmise that it is towards the end of the day but she is able to continue due to a soft fading light emanating from her left. Seurat has modelled her face, hands and meticulously combed hair, with the most delicate applications of the crayon especially in the creation of the parting in her hair and he has left the paper blank to represent the bow of her blouse. An atmosphere of diligent concentration is beautifully conveyed. 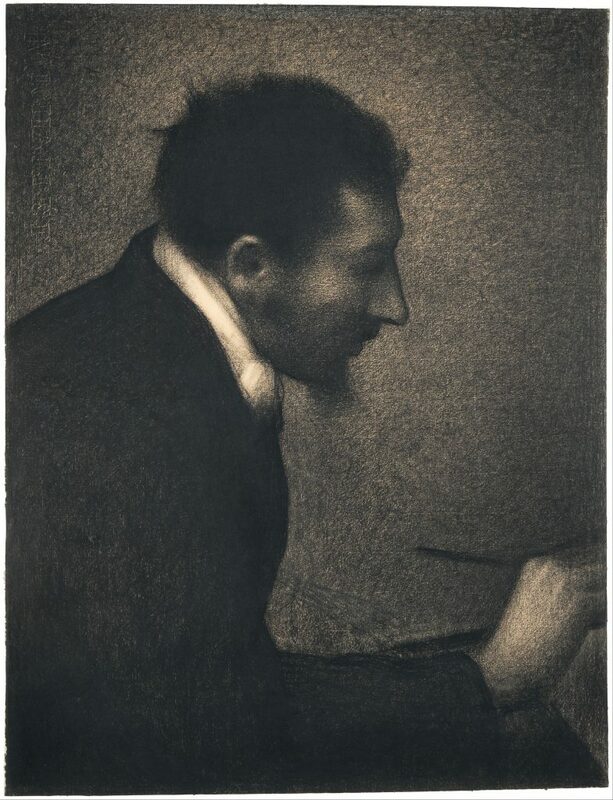 Many of Seurat’s drawings were preparatory studies for his large scale works – eight studies were used for the figures in the Bathers at Asnières and twenty four drawings were employed in formulating the complex compositional decisions necessary for the A Sunday on the Island of the Grande Jatte. Other drawings were produced as independent works many of which were shown at exhibition. In search of motifs Seurat shunned the picturesque set pieces of central Paris, much of it recently modernised during the rebuilding overseen by Baron Haussmann. Rather he gravitated towards the northern and north-western suburbs – unremarkable locales where he chose unremarkable subjects including commercial and factory buildings, bridges, silent streets and chimneys. 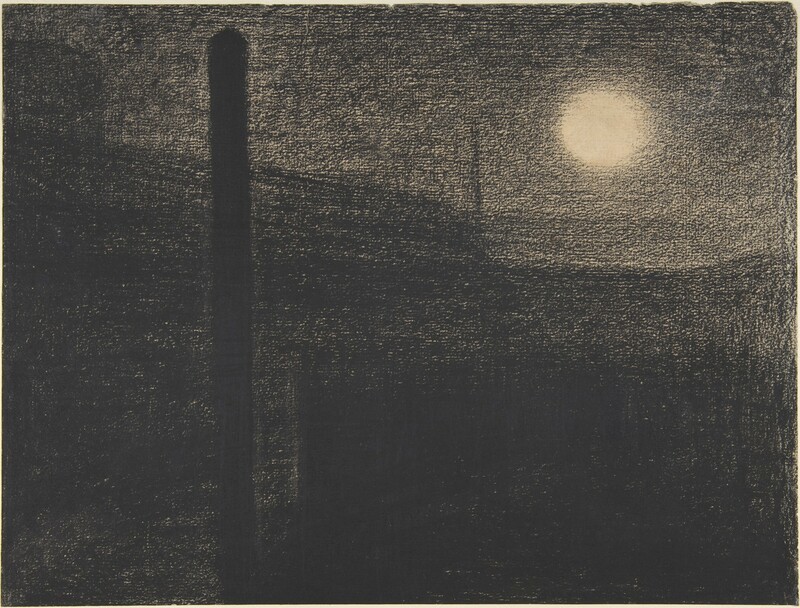 For example Courbevoie: Factories by Moonlight of 1883. He also drew figure studies which eschewed any idea of individuality – faces are blank – mere placement ovals. Often they might be seen as examples of differing social strata. His emphasis was on simplicity and generality but he also achieves a sense of mystery and loneliness. His figures are depicted in profile, some of which were used as studies for his second great monumental masterpiece, A Sunday on the Island of the Grande Jatte. As well as his output of drawings he was producing oil studies, often painted on small panels, sometimes referred to as cigar box lids although they were almost certainly sourced from artists’ suppliers. They were just the right size to fit in a portable paintbox. He called these oil studies his croquetons and again, many of them formed the basis for some of the figures and topography for the Bathers at Asnières and the Grande Jatte.